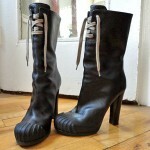 after years and years of searching, i finally found the most perfect beautiful rainboots. these look like leather but they’re actually rubber. they are, however, lined inside with calfskin— just in case anybody is wondering (like i did) where the hell Fendi gets off charging so much for a rubber boot.